The creation of drawings and animations for the display on a rented, solar-powered, and road-side led message screen on wheels, also known as a Portable Changeable Message Sign (PCMS, the name of these devices in governmental documents). I 'inserted' such a message display device at a location alongside the campus main entry road, the type of placement to be expected for devices like these to temporarily give any needed traffic related warnings or messages. However in this case it displayed unusual, ambiguous messages: my minimal and abstract drawings and animations, patterns and forms that were informed by my former studio-based drawing and painting practice and earlier digital media explorations, but that also referred to aspects of the surrounding site. The display capability of this traditionally non-art and purely functional device was used as a platform for my custom created graphic digital art. The art was informed by the medium, the surrounding environment as well as my drawing/painting practice. The placement of the device itself was an example of my type of interventionist practice where I like to insert a catalyst type creation into a real world situation to invite new creative relations with the world. So I created a context where attention to the changing situation can lead to new creative possibilities in creating ones relation with the surrounding world. Having worked with the screenbased and public I/O project before I was first fascinated by the possibilities of a street situation I found in downtown San Francisco: a busy shopping street with the mobile electronic message board on the side of it displaying traffic redirections and has been captured in one of my many photographic 'notes' that I continually take. Its location was actually not far of where the I/O project existed a few years before. Ideally I would have placed my PCMS back in such an urban situation, as that was where I first thought of it. At this point I created it for the Mills College campus site however, as an outside sample of my work and in the context of the MFA graduation show. This is a work however that I want to work with at (and adapt for) other (road-side) places again in the future. Oakland; Mills College campus, along the main entry road and near the water stream and the library. Public intervention, and part of the 2005 Mills College MFA show. Creation of site-related, abstract digital drawings and animations for an electronic led screen. 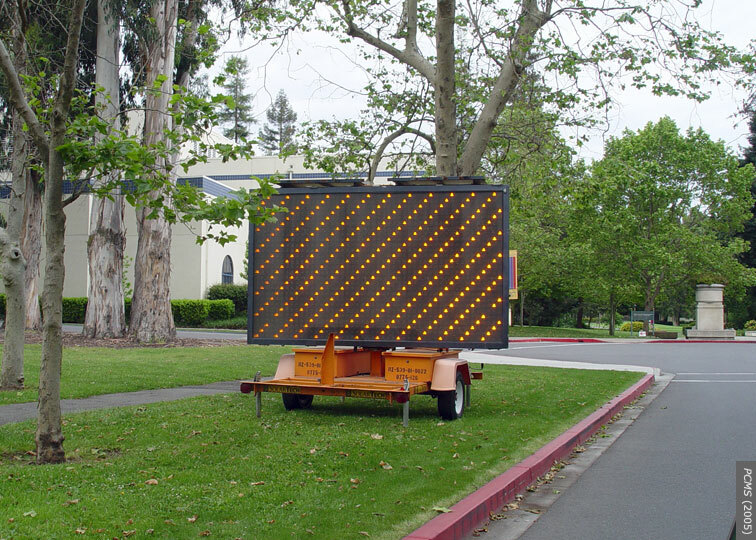 Display of these on a rented, mobile, solar-powered, led traffic message board; that was positioned alongside a road for a week.